Savoring the island's agricultural and gastronomic offerings, from morning coffee to evening beer. Floating on the waves and hiking through the jungle are must-do activities on Kauai. But to better commune with the westernmost of the well-populated Hawaiian Islands, I also wanted to taste the local bounty. Fortunately, there are great ways to savor what makes Kauai unique without breaking the bank at gourmet restaurants. There may be nowhere else on Earth you can visit a coffee farm, a microbrewery and a cacao farm in such close proximity, surrounded by lush mountains and sandy bays. With a bit more time, you can watch delicate taro chips sizzling in oil and buy aromatic lychees by the bag. A friend and I managed all of the above in between naps at the beach, and our farm-to-table adventures introduced us to people and places we would have otherwise missed. Whether at home or on vacation, I reach for coffee when I wake up. I was born and raised in Seattle, after all. But I had never encountered an actual coffee tree until we made a trek to Kauai Coffee Company’s picturesque plantation by the sea. Situated near Hanapepe on the island’s south shore, the land was for 100 years a sprawling sugar estate owned by the wealthy Alexander and Baldwin families. Their company began growing coffee rather than cane on the land in the 1980s, as sugar plantations across the Hawaiian Islands were closed down. 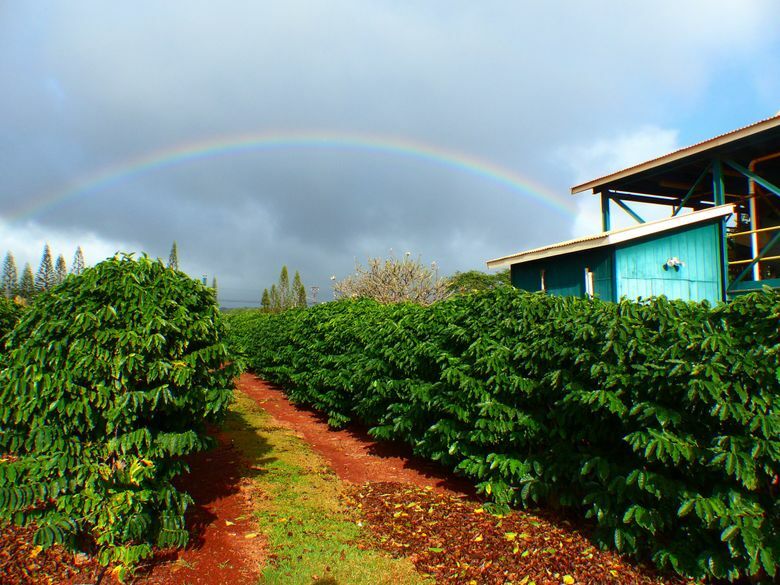 “Beet sugar started to replace cane sugar,” said Darla Domingo, who manages the plantation welcome center, where you can sample a variety of Kauai Coffee brews and join walking tours to see the red and yellow cherries that encase the precious beans. The estate is massive, with 4 million trees covering 3,100 acres tended to by more than 100 union workers. Multinational company Massimo Zanetti runs the coffee operation, so the atmosphere is more corporate than homey, and the brews themselves are less than spectacular. But there was something magical about strolling down rows of coffee trees, their waxy green leaves shimmering, within view of the ocean. Because the trees need mild sun and rain, they’re mostly cultivated on shady mountainsides, like the slopes of volcanoes on Hawaii’s Big Island. But on Kauai, a sea breeze does the trick, we learned, straining to detect some hint of salty spray as we sipped. For a more rustic experience, try Hanapepe, a sunbaked little river town with historic storefronts. Stomachs grumbling, we parked outside the ramshackle building with peeling paint where Dale Nagamine has made taro chips for 36 years. The taro root plant is a staple in native Hawaiian cuisine, and Nagamine’s chips are sliced letter-thin, dusted with garlic salt, deep-fried and baked. The sign beside the door read Taro Ko Chips Factory, but the timeworn kitchen was barely large enough for Nagamine and a pal, who were watching football when we arrived. Rather than use a website or Instagram account to drive business, the laconic master chipmaker counts on tradition and word-of-mouth. Flecked with purple, his crunchy snacks are understated yet addictive. 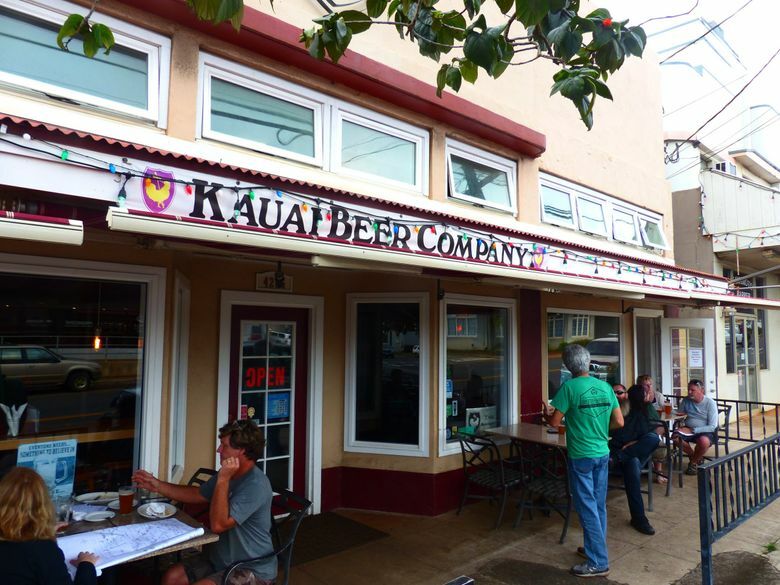 Another laid-back option is the Kauai Beer Company brewpub in Lihue, the southeast-shore town where the island’s airport is also located. The suds are top-notch, the grub is tasty and the vibe set by easygoing owner Jim Greuber is friendly, attracting a mix of tourists and locals. When we popped in for lunch, the other customers included mainland families and construction workers. The hops and barley are imported, but Greuber and his son, Justin, write the recipes themselves and brew the beer on-site — about 650 pints per day. Their mainstay is Lihue Lager, while their pride and joy, Black Limousine, combines a light taste and dark color. “This is such a special place … but don’t tell anyone that,” he joked. His small-scale operation near Kapaa, called Steelgrass Farm when we took the tour, has since been renamed Lydgate Farms. 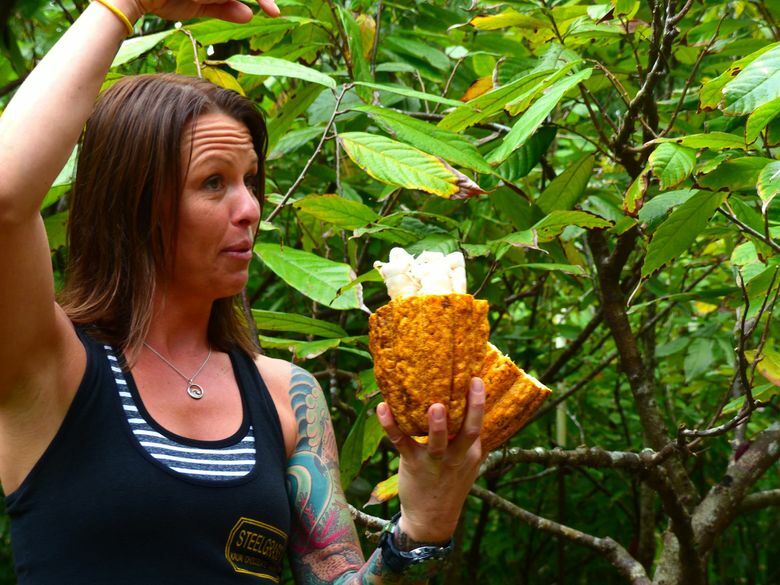 Entrepreneurs have recently been begun cultivating coffee in California, but Hawaii remains the only U.S. state where cacao can be reliably grown — and there was a real thrill in watching our guide slice open a bright yellow cacao pod to reveal the beans inside. We learned how chocolate came to be and how the sweet stuff gets made. Earlier, the group tour covered other plants grown on Kauai, such as vanilla and black sapote, a persimmon-like fruit with pulp like chocolate pudding. “Treat it like nature’s jello shot,” suggested our guide, a surfer from California, as she introduced rambutan fruits — lychee-like balls with translucent flesh and spiny red skins. The morning ended with a chocolate taste test, including 10 varieties from Lydgate Farms and around the world (afterward, I bought a bar of the estate’s milk chocolate with sea salt). The tour was too pricey and long. But the chocolate was superb, the junglelike grounds were beautiful and the idea behind the farm was intriguing. Lydgate says growing cacao is his way to connect with the island, and he believes artisan chocolate, like specialty coffee, could turn into a craze as evaluation standards are set. His experiment is part of a broader trend on Kauai, where visitors also can sip on locally distilled rum or tour a historic rice mill and taro farm. Farmers markets abound on Kauai and they’re an easy and enjoyable way to nosh and stock up on local produce. You can peruse tables piled high with pineapples, coconuts, avocados and star fruit for a few minutes or an hour. For $5 at a Saturday market in Hanalei on the north shore, I bought a bag crammed with two dozen rambutan. Then I struck up a conversation with Matthew Cummings, who learned how to drive from the seat of the tractor used in his family’s 10-acre orchard. When he wants a snack, Cummings reaches for soursop fruits – spiky green ovals with creamy flesh that taste a bit like tangy bananas. Farmers markets are important to Kauai residents because they promote healthful eating habits, he said. Many vendors sell only organic products. “Every day, there are markets that pop up around the island,” Cummings said. Another popular Saturday market, at Kauai Community College, features island cheeses, pies and jams. Wandering through the Hanalei market later, I browsed handmade artwork and clothes. It was a misty morning and a local musician was singing Hawaiian songs while plucking a ukulele. Taro leaves planted between the market and the mountains swayed in the breeze. Finished with my fruit, I lingered longer than intended, which was OK. There was nowhere else I had to be. Hourlong “Coffee on the Brain” plantation tours at Kauai Coffee Company in Kalaheo are $20 per person and start at 8:30 a.m., Tuesday through Thursday and Sunday. Shorter walking tours, daily at 10 a.m., noon, 2 p.m. and 4 p.m., are free. Visit kauaicoffee.com. Don’t miss Taro Ko Chips Factory in historic Hanapepe. Knock on the screen door to check whether the store is open. Taro, potato and sweet-potato chips are $5 per bag, cash only. For a relaxed beer or three, stop by Kauai Beer Company. The brewpub’s regular hours are 11 a.m. to 10 p.m., Tuesday through Saturday. See kauaibeer.com for more information. The cocoa-tree tours at Lydgate Farms run from 9 a.m. to noon, Monday through Friday. The price is $95 for adults; kids 12 and under are free. The tours include chocolate and tropical-fruit tasting. More at lydgatefarms.com. Various websites maintain farmers market schedules, including Tasting Kauai: tastingkauai.com/farmers-markets/.